So what if Russell Crowe's Maximus dies at the end of Gladiator? That won't stop him from returning in a sequel. This is Hollywood after all, and if there is a way to rejuvenate a hit movie, someone will do it. Luckily, with this potential franchise in the making, the person who knows how to bring Maximus back to life is the man who directed the original, Ridley Scott. And he claims to have the perfect idea for Gladiator 2. Ridley Scott has spent this past weekend in Texas, at the SXSW film festival that happens annually in Austin. Showing off footage from his upcoming prequel Alien: Covenant, he took a moment out to chat with Entertainment Weekly about a long discussed sequel to Gladiator 2. He's wanted to do it for awhile. And he does know how to bring Russell Crowe back. 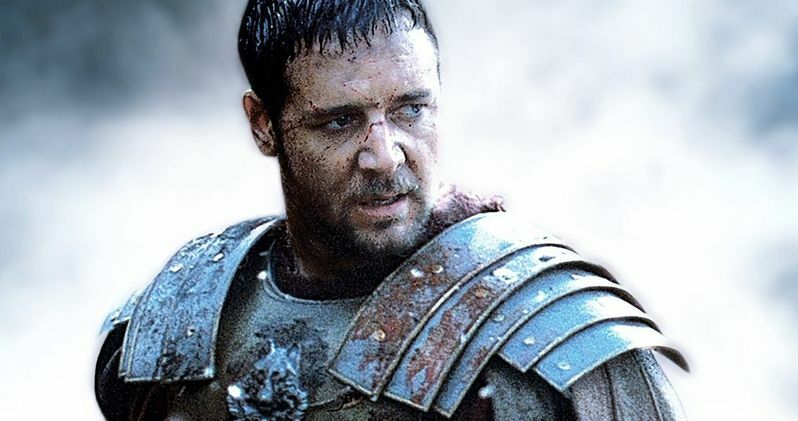 It has long been rumored that Gladiator 2 is in development. Scott doesn't disprove that. Though, writing a screenplay, considering the lead character is lion food, has always been a bit of a problem. Despite this, Scott wants to do the sequel. And he definitely wants Russell Crowe back if Crowe decides it's something he'd do. Says Ridley Scott, speaking from the Nat Geo Further Base Camp on Friday. "I know how to bring him back. I was having this talk with the studio, 'but he's dead.' But there is a way of bringing him back. Whether it will happen I don't know. Gladiator was 2000, so Russell's changed a little bit. He's doing something right now but I'm trying to get him back down here." Sadly, Ridley Scott wouldn't describe his great idea that would resurrect Maximus from the bowels of the mighty creature that devoured his corpse. It was reported years ago, that Crowe had hired rockstar turned screenwriter Nick Cave to take a turn at penning a sequel. That movie had Max traveling through his afterlife. Scott didn't mention if this is the idea he wants to utilize. Scott was at the SXSW to show off some of his new Alien movie while discussing it with the beer and BBQ saturated journalists in attendence. He even hosted a special screening of his original 1979 Alien late last night. Gladiator swept up at the 2001 Oscars. It won Best picture and gave Russell Crowe a Best Actor award. However, Ridley Scott lost the best director award to Steven Soderbergh for Traffic. Gladiator was also a hit at the box office, pulling in $457 million in 2000.